Do you want to change your relationship with painful thoughts and feelings that are holding you back from making changes to improve your life? 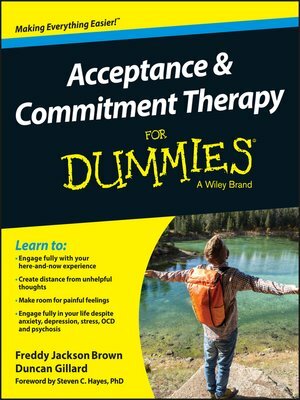 In Acceptance and Commitment Therapy For Dummies, you'll discover how to identify negative and unhealthy modes of thinking and apply Acceptance and Commitment Therapy (ACT) principles throughout your day-to-day life, creating a healthier, richer and more meaningful existence with yourself and others. Closely connected to Cognitive Behavioural Therapy (CBT), ACT is an evidence-based, NICE-approved therapy that uses acceptance and mindfulness strategies mixed in with commitment and behaviour-changing strategies to help people increase their psychological flexibility in both their personal and professional lives. With the help of this straightforward and authoritative guide, you'll find out how to target unpleasant feelings and not act upon them—without sending yourself spiraling down the rabbit hole. The objective is not happiness; rather, it is to be present with what life brings you and to move toward valued behaviour. Whether you're looking to practice self care at home or are thinking about seeing an ACT therapist, Acceptance and Commitment Therapy For Dummies makes it easier to live a healthier and more productive life in spite of—and alongside—unpleasantness.